Koolulam Shows How Yom HaAtzmaut Should Be Done: On the slight off chance that you might not have seen this already, Abq Jew is thrilled to share! Koolulam is a social-musical initiative aimed at bringing together people from all corners of the diverse, multi-cultural Israeli society. Our idea is to stop everything for a few hours and just sing - together. The project enables its participants to enjoy the feeling of togetherness through a deep communal experience - our sounds and voices coming together to create a social choir, full of hope and optimism. Koolulam, the social singing initiative that’s taken Israel by storm, started celebrating earlier when it gathered 12,000 people, including President Reuven Rivlin, musician Shlomi Shabat, Tel Aviv Mayor Ron Huldai and MK Gila Gamliel at Tel Aviv’s Menora Mivtachim Arena to sing Naomi Shemer’s iconic “Al Kol Eleh,” “For All These Things,” in preparation for Israel’s 70th. President Rivlin, a guy who loves to sing, got this particular Koolulam project off the ground, supported by Or Teicher, Michal Schneiderman and Ben Yefet, the three Koolulum founders. Koolulam is a year-old social phenomenon that has gathered thousands of Israelis to sing everything from songs by Sia and Imagine Dragons to … Naomi Shemer, perhaps Israel’s greatest songwriter. On Monday, Israeli President Reuven Rivlin joined Koolulam at a mass singing of Shemer’s “Al Kol Eleh” to honor Israel’s upcoming 70th anniversary. 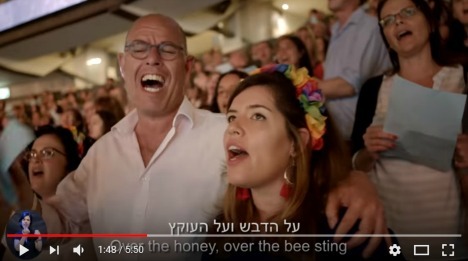 A cute video he made convinced my wife to get us tickets for the event at Tel Aviv’s basketball arena, a shed where shouts from Maccabi Tel Aviv basketball fans and the wail of electric guitars from overseas rockers are more common than a mass rendition of a classic Hebrew folk song. We arrived at the sold-out arena alongside 12,000 Jewish Israelis — young and old, religious and secular, Ashkenazi and Sephardi. Previous Koolulam events in Jerusalem and Tel Aviv have focused on cancer patients and their doctors, Holocaust survivors and women, and even drew a smattering of haredi Orthodox. 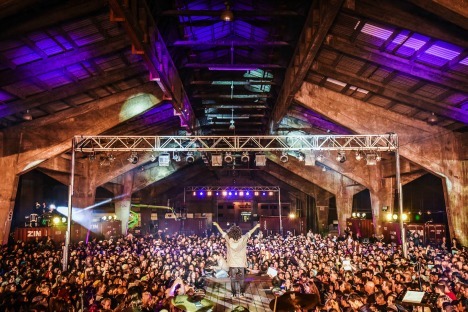 On Feb. 14, Muslim, Christian and Jewish Israelis were invited to Haifa to sing Matisyahu’s hit “One Day” in Hebrew, English and Arabic; 3,000 people showed up. About that cute video that Ruvi Rivlin made: Here it is! You don't even have to click the link! And the now world-famous Koolulam video? Right here! 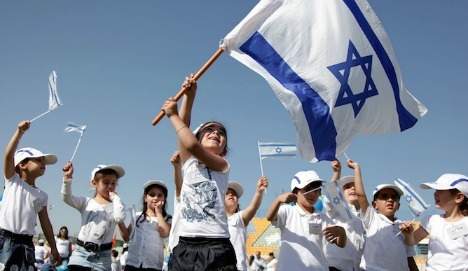 the Land of Israel has never felt pure joy in his life.